The 2010 Anti-Smuggling Legislation: an excuse to lock the borders? Are we punishing smugglers or finding a covert way to lock Australia's borders? "The Immigration Department (and related agencies) has no mandate to "stop the boats", and it never had that mandate - this legislation is not, or at least should not be, about stopping any refugee boats from reaching Australia." "The amendments as proposed in this Bill are about stopping criminal people smuggling ventures, but the Bill conveys the impression that its true purpose is to stop any boats from reaching Australia without anyone on board being able to avoid harsh prosecution." "In view of commitments given by Australia under the UN Refugee Convention, also to refugees arriving by boat, this gives the legislation the appearance of being highly manipulative in nature." This page introduces Project SafeCom's submission to the Senate Legal and Constitutional Affairs Committee's Inquiry into the Anti-People Smuggling and Other Measures Bill 2010. You can find the home page of this Inquiry on the Australian parliament's website here. This page also links to some additional documents cited in the Submission and some media items and transcripts about the proposed laws are added to its contents. 8 May 2010: Laws for smugglers are jailing the ferrymen - Australia's nasty laws jail innocent Indonesian fishermen instead of smugglers: By marginalising the fishing communities that used to fish around Ashmore Reef for centuries, we contribute to their availability to smuggling networks as sailors. Australia supplied and 'trained the bus drivers for the bus company' - the sailors we jail as people smugglers. 11 March 2010: SBY in Canberra: smugglers will be crims - but the passengers? - Susilo Bambang Yudhoyono's remarks were reported after the morning press conference by AAP, but no media outlets picked them up or read between the lines. What the Indonesian President gave away after closed-door talks in Canberra was more than we heard from Australia's Prime Minister Kevin Rudd. 8 November 2009: Kevin Rudd, stuck and becalmed in Merak - Australia's Prime Minister dreams of an Indonesian Solution that fails within a week. Rudd may have made 'that phone call' to President Bambang Yudhoyono, promising even more funding 'to stop the boats' before they would arrive in Australian waters, but he had not counted on local resistance and to fury from Australia and the rest of the world..
21 September 2009: Seeking asylum: Non-protection horrors in Indonesia - An expose of media debate and coverage of the rapidly detoriorating warehousing situation in Indonesia, sponsored by the Rudd government - where the International Organisation for Migration, UNHCR Jakarta and the Australian and Indonesian government all 'assist' to wreck the lives of thousands who seek protection and a better life in Australia. "With a substantive submission to the Senate Legal and Constitutional Affairs Committee, in response to its call for comments about the recently tabled Anti-people Smuggling legislation, we have made it abundantly clear that the laws are no excuse to legislate that any arrival of refugees and refugee groups by boat is illegal, and that legislation cannot include stealthy clauses which undermine core definitions in the United Nations People Smuggling Protocol," WA Human Rights group Project SafeCom said this morning. "The laws are a thinly veiled attempt to manipulate the limitations imposed on signatory states through the United Nations definition of what constitutes people smuggling," spokesman Jack H Smit (who undertakes post-graduate university research into Australia's people smuggling laws) said. "The legislation proposes to eliminate from Australia's Criminal Code clauses that include the smuggling to have occurred "for material benefit", the central clause in the nature of people smuggling under the United Nations Convention for the Smuggling of Migrants and its attached Smuggling Protocol." "As a result of this proposed change, any group of refugees that organises their own voyage through an organiser, whether a smuggler or not, will have their leaders prosecuted, because the laws will say that they have smuggled people into Australia." This change amounts to a brazen attempt to criminalise the entry into Australia of anyone arriving by boat." "These disgraceful laws complete the development - in line with comments regularly made by advocates - where the priest who smuggled the Von Trapp family across the Alps, as well as Oskar Schindler, will now be jailed as people smugglers by Australia." "I have told the Senate Inquiry about the voyage of Mr Nguyen Van Minh, who organised the coming together of 98 of his family members, in the process collecting 103 ounces of gold to build the boat and bribe Vietnamese officials. This collective effort by the 98 Vietnamese made fleeing from Vietnam following the fall of Saigon a reality," Mr Smit said, "but under the proposed laws, Mr Van Minh would be arrested and jailed for up to 20 years for coming to Australia." The story first appeared in the West Australian newspaper, and later (October 8, 1981, p. 12) in the Canberra Times. "While it is already far-fetched to call impoverished Indonesian fishermen "people smugglers", Australia under Gough Whitlam started destroying the Indonesian fishing communities around Roti Island in 1974, when under a secret agreement with former Indonesian President Sukarno it stole their fishing grounds, including Ashmore Reef, where they had fished for centuries," Mr Smit said. "The Opposition spokesman for Immigration, Mr Scott Morrison, has also made similar comments about the Indonesian fishermen in a doorstop interview on February 24 this year." "It was Australia, who after stealing the livelihood from the Indonesians, became guilty of 'training the bus drivers for the bus company'. We prepared their desperation so they could be used by the smugglers," Mr Smit said. "It is not a crime to use a people smuggler, and it has never been a crime. Under the new laws, criminal prosecutions will take place for those who "provide material support for people smuggling". There is no clarity in the laws that safeguards the sending of money for support and food to family members or friends in Indonesia, also to those who may want to use smugglers to travel from Indonesia to Australia. Under the laws, anyone with links to refugees in Indonesia is going to be monitored and may be prosecuted. These laws may see academics, lawyers, NGOs, advocates and refugee families in Australia prosecuted and jailed, Mr Smit said. "All these parties may now have their phones bugged, their homes raided under the secrecy of ASIO, and they may be arrested by Australia's questionable spy agency that will carry out their dirty work under the new laws." "There's just one appropriate location for the proposed laws," Mr Smit said, "and that's the rubbish bin. There is not a single item in the legislation that does not breach the United Nations Convention for the Status of Refugees and its 1967 Protocol, or the 'United Nations Convention against Transnational Organised Crime' and its attached 'Protocol against the Smuggling of Migrants by Land, Air and Sea', commonly known as the Smuggling Protocol." The United Nations refugee agency has raised concerns over Australia's decision to temporarily stop processing visa applications from asylum-seekers from Sri Lanka and Afghanistan. The regional representative says the decision could lead to asylum seekers being stuck in mandatory detention for extended periods without effective judicial oversight. The suspension of visa applications is the latest in a string of measures Australia's federal government has taken in recent months to try and deal with the constant flow of asylum seeker boats arriving. One measure involves changes to the laws that govern people-smuggling. Some legal experts are worried planned changes could lead innocent people being unjustly punished. BEN SAUL: I think the bill does two things which are of great concern. The first is that it changes the definition of the existing crime of people smuggling in Australian law. It takes out the requirement that people smuggling be done for a profit motive, in other words what international law says is wrong about people smuggling is that it is the commercial exploitation of other peoples suffering and misery in trying to fleeing persecution. What that means if you take that element out is that of course all kinds of innocent bringing of people to Australia becomes a crime now, that includes, for example, rescuing people at sea, which mariners are required to do under international law, it means bringing someone to Australia where you think they have legitimate documents but those documents later turn out to be fraudulent and ultimately what it means is that the law now criminalises people like Oscar Schindler, who saved people from persecution in the past, criminalises people like the captain of the Tampa ship, who brought asylum seekers to Australia back in 2000. The second thing which the bill does is introduce an entirely new crime of supporting people smuggling. But the problem with this offence is it does not require an intention that the support a person gives to another person be used for people smuggling. So what it means is that a family member or a friend who gives money to somebody overseas or gives money to a charity overseas could find themselves criminalised as a person supporting people smuggling, even if you did not intent that that money go towards people smuggling. SEN LAM: So if your on your sail boat out there and you see someone, an asylum seeker in trouble, you could be prosecuted for taking him on board? BEN SAUL: And bringing them into Australian waters, that's right and of course the law of the sea internationally requires you to rescue that person and to bring them usually to the nearest port, which could be Australia. SEN LAM: So does this breach any international maritime laws that Australia is signatory to? BEN SAUL: Absolutely, I think it is inconsistent with our obligations under the United Nations Law of the Sea Convention of 1982. It's probably inconsistent with the Safety of Life at Sea Convention which Australia is a party to as well. Now some in the government have said look, the law may cover those cases, but it would never be used against people in those circumstances. I am not so sure, I don't have quite so much faith in federal prosecutorial authorities. Often they get it right, but sometimes we know miscarriages of justice happen, because prosecutors use laws or police use laws which are cast far to broadly. What I would say is simply draft the laws to capture the people you want to capture in the first place and don't create incredibly broad badly written laws which go over the top. SEN LAM: But how do we get around this? I understand that you think that people smuggling laws often send a hypocritical message, that the people are considered for refugee status once they are in Australia, but it can be a crime for someone to help those people get to Australia. How do we get around this? BEN SAUL: Well, it's a real problem, because as you say, on the one hand we're offering people freedom if they come to Australia and seek asylum, but in the same breath, if anyone tries to help them get here, it's a crime. I think the real problem here is that there are too few solutions for people who are refugees to find safety or security in another country. There are millions of people who have been recognised as refugees in need of assistance worldwide. Only a tiny, tiny fraction of that number ever gets resettled in another country and gains protection. What Australia needs to do I think is to be far more active in finding solutions for people, not necessarily in Australia, but working with partner countries around the world, funding UNHCR and resettlement programs in other countries, closer to the countries where people are fleeing from in order to reduce those incentives to undertake these incredibly dangerous journeys by boat to Australia, where many, many hundreds of people die. The federal government has signalled a far tougher stand on remittance dealers who transfer funds for money launderers and people smugglers. Home Affairs Minister Brendan O'Connor has released a discussion paper detailing proposals to strengthen regulation of Australia's remittance sector. He said dealers have been recognised internationally as being vulnerable to misuse. "A strong new regulatory regime is needed so that remittance dealers who help criminals, such as people smugglers and drug traffickers, to launder funds can be deregistered," Mr O'Connor said in a statement. "Australian law enforcement authorities are aware that international cash transfer services provided by remittance dealers can also be used to pay the organisers of people smuggling ventures. "We must ensure that this valuable service often used to send money to family and friends can't be misused to support criminal activity." Of greatest concern appears to be hawala (hawala) dealers, who operate a traditional but informal system of international transfer of funds with minimal paperwork. Mr O'Connor said the government wanted to work with the sector to develop a fair and workable registration system. This should ensure the community had access to cheap and effective remittances while minimising misuse, he said. A report released by the Australian Institute of Criminology said there was evidence of misuse of the remittance system in Australia and overseas. Several successful prosecutions had been launched in the US, Britain and Australia. "The cases demonstrated misconduct by offenders over long periods of time, involving substantial amounts of money," the report says. "In Australia, it was found that, on some occasions, the flow of legitimate and illegitimate remittance intertwined and that some ARS (alternative remittance service) dealers were often prepared to handle suspect transactions in exchange for a higher rate of commission." The institute said such misuse was more likely to involve criminal behaviour, such as dealing in narcotics proceeds and tax and customs evasion, as well as financing of terrorism. But the lack of information regarding terrorism investigations made it hard to establish the extent to which remittances were involved. "There is currently no clear evidence of the level of misconduct associated with alternative remittance, although on the basis of the current research and consultations, it is apparent that most transactions are legitimate," it said. It's not just Arizonian legislators who are so paranoid about migration that they feel the need to introduce laws that substantially increase the powers of security agencies and extend criminal liability to the innocent. The Rudd government, supported by the Liberal Party, is just as illiberal on the issue if the Anti-People Smuggling Bill, currently before a Senate Committee that is due to report back to parliament on May 11, is any guide. The Arizona law, signed into law by the State's Republican governor Jan Brewer last weekend, forces individuals to carry migration documentation on them at all times, allows the police to determine a person's migration status and provides for severe penalties for those who hire "illegal" migrants. President Barak Obama describes the Arizona law as one that "threaten[s] to undermine basic notions of fairness". As does the proposed Australian anti-smuggling law in material respects. The ALP/Liberal anti-people smuggling proposals draw heavily on the anti-terrorism laws that were passed in the aftermath of 9/11. In particular, these new laws provide for an offence of "providing material support or resources" to a person who is engaged in people smuggling. This is a replica of the offence with which Dr Mohammed Haneef -- the Gold Coast doctor wrongly arrested at Brisbane airport in 2007 on suspicion of involvement in terrorism plots in the UK -- was charged. The flaw in what are termed "extended liability" offences is that they drag into the net people who are completely innocent, such as Dr Haneef. What will happen with this proposed law is that when authorities are investigating a people smuggling exercise they will seek to charge family members and community supporters living in Australia who may have sent money, or made phone calls, or sent emails to asylum seekers who paid the people smugglers for the journey to Australia, on the basis that they may have given encouragement to people smugglers. A Sri Lankan person in Australia who emails a family member who is an asylum seeker and gives them the names of persons who might be able to assist their passage to Australia may be caught under this proposed law. Consider also a provision in the Bill that removes the current requirement in the law for the prosecution to show that a person obtained, or intended to obtain, a benefit from people smuggling activity. As the conservative Law Council of Australia notes in its submission on the Bill, this will lead to a "wide range of people" being caught including, "family and community members and humanitarian organisations who seek to help friends, relatives and other vulnerable people escape, by whatever means are available, from a war or disaster zone or from some other form of persecution". ASIO will see its powers greatly expanded under the proposed law. It will be given the power to gather intelligence on matters pertaining to "the protection of Australia's territorial border integrity from serious threats". The Australian Privacy Foundation, an NGO, describes the ASIO provisions as representing "one of the most significant expansions" of its powers in its history. Here's some advice for refugee advocates and even lawyers who act for asylum seekers; get ready to be surveilled by your friendly ASIO agent. The Rudd government is introducing mandatory jail terms for anyone found guilty of people smuggling where there is danger of death or serious harm, or where the people smuggling involves five people or more. Courts have to send people to jail for no less than three years or five years in such cases. This means a person who may have played a minor role in the offence, or who has no prior convictions, be very young or from a very poor background (such as an Indonesian fisherman) will face ruin if they are apprehended in Australian waters. A modern-day Oskar Schindler would be jailed for up 10 years under the Rudd government's proposed crackdown on people smuggling, lawyers say. In largely unscrutinised changes, backed by the opposition, the government is introducing new criminal charges for supporting people smugglers, even unwittingly. "It's mind-blowing legislation. I've never seen anything like it," the University of Sydney Professor of Public Law, Mary Crock, says. "These laws capture innocent people who may be operating under perfectly good humanitarian reasons." Currently, the law defines people smugglers as those who are acting for profit when bringing five or more people to Australia. Proposed laws make criminals of anyone sending money to asylum seekers overseas, who later use it to pay a people smuggler. They also capture Australians who organise for asylum seekers to escape danger for no financial gain, jeopardising some of the work of charitable organisations. The president of the Refugee Advice and Casework Service, Ben Saul, said the changes had so far evaded the attention of refugee communities they would affect. "Unfortunately, most of the focus is on recent changes to asylum policy,'' he said. ''This one's snuck under the radar." Non-government organisations have recently increased criticism of the government's freeze on processing asylum claims from Sri Lanka and Afghanistan and the reopening of Curtin detention centre. The anti-people smuggling and other measures bill also criminalises ship captains who rescue people on the high seas and bring them to Australia and pilots who unknowingly fly foreigners into Australia on false documents. The Tampa captain, Arne Rinnan, would have been jailed if the laws had existed in 2001, Professor Saul said. The Norwegian captain made international news when he rescued more than 400 asylum seekers from a sinking boat and the Australian government denied him access to an Australian port to offload them. "You could capture anyone, from a mariner at sea who saves people whose lives are at risk on the high seas - like captain Arne Rinnan - through to people who saved Jews from extermination in the Second World War like Oskar Schindler, who didn't do it for a profit," he said. The changes planned for Australia go beyond comparable laws in the US, Canada, the UK and New Zealand, he said. The government proposed the changes in February, saying they subjected people smugglers to the "full force of Australian law". At the time, Attorney-General Robert McClelland said the measures were a part of Labor's "hardline approach to combating the scourge of people smuggling". The proposed laws also extend ASIO's powers. The domestic spy agency's remit will soon go beyond intelligence to cracking people-smuggling syndicates. If the bill is passed, ASIO will be able to tap the phones of anyone suspected of supporting people smugglers. The opposition has questioned how ASIO would be supported in its new work. Opposition immigration spokesman Scott Morrison has said the proposed laws are ''too little too late''. The government has said the changes would be cost-neutral. Defence intelligence officers would get increased powers to tap phones within Australia, and ASIO officers would be allowed to carry weapons, under controversial proposals contained in a secret review of the nation's intelligence services. The review also proposes that officers of Australia's overseas spy agency, ASIS, be given increased powers to carry weapons, and to engage in ''paramilitary'' activities abroad, intelligence sources have told The Age. It is believed the review is being driven by the Department of Prime Minister and Cabinet, and that its results will soon go to the head of the department, Terry Moran. From there, it will go to Prime Minister Kevin Rudd and other ministers. The review is so shrouded in secrecy that a spokesman for Mr Rudd denied its existence. Spokesmen for Attorney-General Robert McClelland and Defence Minister John Faulkner directed inquiries to Mr Rudd's office. Among the most controversial proposals is to give the Defence Signals Directorate, Australia's electronic spy agency, domestic wire-tapping powers to combat terrorism and trans-national crime. At present, the agency is legally restricted from spying on Australian citizens. It does, however, provide technical assistance to ASIO and other agencies for specific operations. Intelligence sources said that under the proposed new powers, the directorate could perform domestic wiretaps after a formal request by ASIO or ASIS, requiring only a warrant from a judge. Last year, national security expert and then adviser to the Rudd government, Ross Babbage, argued that the directorate should be given powers to spy on Australians at home or overseas to deal with evolving security threats including terrorism and cyber warfare. Giving the agency broader powers to spy on domestic communications would require new civil liberties safeguards and major changes to the existing legal framework covering the intelligence realm, Professor Babbage also said. The directorate would also get more funding and support for waging cyber warfare against other countries. This comes after revelations that Australian mining companies have been hit by cyber attacks believed to originate in China. Increased freedom for ASIS officers overseas to carry weapons and carry out ''paramilitary'' actions is also likely to be controversial. ASIS lost its gun licence after the Melbourne Sheraton Hotel debacle in 1983 when hotel guests were terrorised by armed agents. The Rudd government is increasingly emulating the worst tendencies of the Howard years. Hard on the heels of its decision to walk away from the Brennan inquiry's recommendations for human rights legislation, it is moving to boost the already excessive powers available to intelligence agencies. Proposed new criminal charges to discourage people smugglers, combined with the revelation that a secret review has recommended that our spies be given greater authority to tap telephones within Australia, carry weapons and even engage in "paramilitary" activities overseas, pose grave threats to civil liberties, privacy and our international reputation. 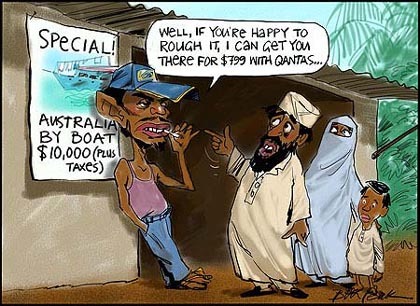 People smuggling for profit is a wicked trade. Those who prey on desperate refugees, extorting their meagre savings and putting their lives at risk on leaky boats, deserve to be pursued and punished. But this does not justify the sweeping measures the government is introducing. Unlike the present law, which defines people smugglers as those who act for profit in bringing five or more people to Australia without authority, new criminal offences would outlaw supporting people smugglers, even unwittingly or for humanitarian reasons. It would be a crime to send money to asylum seekers overseas who subsequently used it to pay a smuggler, or to organise for asylum seekers to escape danger, for no financial gain. The proposed laws could lead to the jailing of a ship's captain who rescued people at sea and brought them to Australian waters - like the Tampa's master in 2001 - or of an airline pilot who unknowingly flew foreigners here on false documents. For bad measure, the Australian Security Intelligence Organisation would be able to tap the phone of anyone suspected of supporting people smugglers. Predictably, the Coalition, while backing the changes, is complaining it is all too little too late. There may be more to come. The Herald has learnt that a secret review of the intelligence services recommends the electronic spying agency, the Defence Signals Directorate, be given domestic wiretapping powers to help combat transnational crime and terrorism and more funding to wage cyber warfare against other countries. The review suggests the agents of the overseas spying agency, the Australian Secret Intelligence Service, be given greater freedom to carry weapons and, chillingly, to engage in undefined "paramilitary" activities, just like their British and American colleagues. ASIO officers would be allowed to carry weapons for self-defence. True, these are dangerous times. Governments need to take prudent precautions - like being exceedingly wary of extending the powers that secretive, overzealous spooks can misuse or abuse. Human rights groups are concerned that proposed new anti-people smuggling laws could see refugee supporters jailed for up to 10 years. TONY JONES, PRESENTER: Human rights groups are concerned that a proposal to beef up Australia's anti-people smuggling laws could see refugee supporters jailed for up to ten years. The proposed laws could snare family members and refugee activists who send money to asylum seekers coming here by boat. The draft bill also gives ASIO (Australian Security Intelligence Organisation) new powers to spy on people it suspects of involvement in people smuggling both in Australia and overseas. JOHN STEWART, REPORTER: Since the Rudd Government came to power in 2007 more than 100 asylum seekers' boats have made the perilous journey to Australia. The Federal Government and security agencies say the increasing number of arrivals is a potential security threat. DAVID FRICKER, DEPUTY DIRECTOR GENERAL, ASIO: It is a very lucrative business. There are large volumes of money involved. It is organised. JOHN STEWART: But a proposed new anti-people smuggling bill has brought them into conflict with legal and human rights group. ASSOCIATE PROFESSOR BEN SAUL, SYDNEY CENTRE FOR INTERNATIONAL LAW: It means people like Oscar Schindler, who put his own life at risk to save Jews in the Second World War, could find themselves criminalised as a people smuggler here in Australia. JOHN STEWART: Currently ASIO is restricted to investigating issues of national security like terrorist threats, but under the new laws ASIO could become directly involved with gathering intelligence about people smuggling activities; including the use of telephone intercepts to monitor people both in Australia and overseas. ROBERT MCLELLAND, ATTORNEY GENERAL: We will now, as a result of these amendments, if they're passed, enable ASIO to become directly involved. We don't believe and it's not intended diminish from its primary role of counter terrorism. DAVID FRICKER: So it would mean that if a people smuggling operation was being led by, for example, the Australian Federal Police, they required to a compliment of some analytical capability that ASIO possessed they could ask us, for no other reason than to investigate people smuggling, they could make that request to us and we would be able to contribute. At the moment that wouldn't be, that wouldn't be possible. JOHN STEWART: Sara Nathan fled from Sri Lanka over 20 years ago. Today she works as an asylum seeker activist providing support for Tamil people who've travelled to Australia. She says she has already been approached by ASIO to gather information about Tamil asylum seekers but she knocked them back. SARA NATHAN, ASYLUM SEEKER ACTIVIST: It was very suspicious. I didn't want to meet them at a strange place that I had not chosen and they wanted me to come alone and they didn't want me to tell anyone. So, all this was bit intimidating and I said "No, I don't feel safe doing that". JOHN STEWART: Aside from the changes to ASIO's powers the new bill also makes it an offence to provide material support for those who have become involved with people smuggling. The offence carries a 10 year jail term. Sara Nathan fears that refugee activists and family members who send money to asylum seekers could be caught in the net. SARA NATHAN: At times we have sent money for phone credit and medicine and so on which all adds up to, perhaps, a substantial amount because we have done fundraising. We don't want to be suspected by ASIO that we are funding people smuggling and thrown in jail. JOHN STEWART: Refugee activists say that if the new anti-people smuggling bill becomes law later this year, Australians will become far more reluctant to help people fleeing from war zones and political persecution. SARA NATHAN: The main thing is humanitarian assistance is going to cease because if I ask people to send money to buy mediciation or to buy basic clothing or food people are gonna say "Oh look I better not get involved in this just in case ASIO suspects and then I have to go through the whole process". JOHN STEWART: ASIO officials made a rare public appearance at a recent Senate hearing and backed the Government's view that people smuggling has become a sophisticated international crime. DAVID FRICKER: The logistical organisation to gather people together, to move them from one point to another, to meet a vessel, to meet another vessel to then come to Australia requires a high level of organisation. There's just not one person acting alone on a one-off voyage and the money and the amounts of money are significant. JOHN STEWART: Critics say the new laws will give too much power to ASIO. ASSOCIATE PROFESSOR BEN SAUL: The long term consequence, of course, is that ASIO might use that information to issue adverse national security assessments against a person here in Australia and then deport that person on the basis of that information and in those kind of cases nobody can see the evidence. JOHN STEWART: The anti-people smuggling bill will be debated in Parliament later this year. The Refugee Council of Australia (RCOA) has today written to the Attorney General to express concerns with the findings of the Senate committee inquiry into the Anti-People Smuggling and Other Measures Bill 2010, which appear to ignore the evidence and concerns raised by the majority of submissions. In the letter, RCOA has outlined that the Bill is inconsistent with Australia's international legal obligations, lacks sensitivity to the needs of torture and trauma survivors, and could go so far as to criminalise humanitarian actions. "We have written to the Attorney General, asking the Government to amend the legislation to address these concerns and to ensure the new laws do not target the wrong people," RCOA chief executive officer Paul Power said. A particular concern for RCOA is the lack of effort to protect people who may be inadvertently caught by the legislation. The Committee report says it would be "highly unlikely" that people who breached the laws for humanitarian reasons would be prosecuted "since such a prosecution would not meet the test of being in the public interest". "While the current government may give assurances that this would not occur, it is not possible to predict what governments may do in the future. Australia has an unfortunate history of policies which have damaged vulnerable people in order to deter others. If the government does not intend that humanitarian actions could be prosecuted, why reserve the right to do so when that could be abused in the future?" Mr Power said. The Bill, RCOA says, is inconsistent with Australia's international obligations, in that while it appears to target asylum seeker arrivals, it does not acknowledge that asylum seekers do have a lawful right to enter Australia for the purposes of seeking asylum. RCOA is concerned that this proposed law would criminalise the activities of aid organisations, humanitarian workers, charity and church workers and other individuals who assist people across borders in other countries for humanitarian reasons. "This law could target people sending money to support a family member in a refugee camp." Mr Power said. The likely impact of the proposed changes on vulnerable people, particularly those who have experienced torture and trauma, needs further examination, RCOA says. "In our letter to the Attorney General, we have stressed the need for ASIO to implement standards of practice and provide appropriate training on working with vulnerable people," Mr Power said. RCOA also recommends that ASIO's expanded powers should be regulated through transparent authorisation and review processes, such as judicial monitoring of telecommunications interception. I rise tonight to speak to the government's Anti-People Smuggling and Other Measures Bill 2010. This bill, as we have heard, seeks to strengthen the government's anti-people-smuggling legislative framework as well as to ensure that people-smuggling is comprehensively criminalised in Australian law. Yet, despite the Attorney-General stating in his second reading speech that the United Nations Global trends report 'indicates that people seeking asylum in Australia reflects a worldwide trend driven by insecurity, persecution and conflict', nowhere in this bill are Australia's obligations to those seeking our protection under international law recognised. I find it very concerning and disappointing that an incredibly complex piece of legislation such as that which we are discussing today has been introduced and is expected to pass with such expediency, with limited scrutiny on the full impact of the proposed measures. All we need to look at is the turnaround time for the inquiry by the Senate Legal and Constitutional Affairs Legislation Committee and the pathetic report that was put together on behalf of the majority of the committee. It was an appalling report that did not reflect the evidence given to the committee, which of course is why I authored a dissenting report. It did not reflect the views of those who are experts in the field and who made submissions. In fact, there was only one submission that supported this legislation, and that was from the government departments themselves. Every other submission spoke about how poorly drafted this piece of legislation was, how poorly defined the definitions within it were, how poorly the arguments as to why this legislation needed to exist in this form had been put by the government, and the lack of public consultation and review that this piece of legislation had had. While it is clear that the Greens are in no way supportive of people-smuggling, that does not mean that this Senate should give up its responsibilities as a house of review; its responsibilities to scrutinise legislation - and this legislation is so, so poorly drafted. While I speak to the legislation itself, I must say that the Greens will not be supporting this legislation going on to the next stage because it is clear that it needs to go back to the drawing board. The government themselves have said that in the absence of bringing forward any human rights act they will introduce a new human rights committee that will scrutinise and review legislation. This should have been the very first piece of legislation that went to that committee. Until this legislation goes to that committee, the Greens believe it should not proceed. The failure of the government to articulate why it is necessary to introduce the measures proposed in this bill highlights that wider public consultation and debate is necessary before these measures can be seriously considered. While it is incredibly important for measures to be implemented to prevent asylum seekers from embarking on treacherous journeys across dangerous waters to get to Australia, I would argue that there are plenty of things the government could have announced in last night's budget to do that. What is the use of spending hundreds of millions of dollars on facilities in Indonesia and billions of dollars on border protection but not increasing the number of refugees you agree to resettle from these treacherous places? It is ludicrous that we talk about the numbers of people arriving here by boat but do not increase the numbers of people we resettle from places like Malaysia or Indonesia, where these people are warehoused in Australian funded detention centres with no hope of freedom despite already being classified by the UNHCR as genuine refugees. Last year Australia took only 70 people from Indonesian detention centres. Seventy people who had been recognised by the UNHCR were resettled by Australia, yet we cry foul at the idea of people jumping on boats, coming to Australia and seeking refuge. The best way for the Australian government to stamp out the scourge of people-smuggling would be to go to the source - that is, to resettle those people who have already been found, in places like Malaysia and Indonesia, to be genuine refugees through processes that Australian taxpayers fund. We should be putting those processes to more effective use and resettling those people, rather than spending the money there, waiting for them to get on a boat to Christmas Island and then spending another billion dollars over the next four years simply because we could not increase our humanitarian intake the way we should have. "You know what? I've stamped strong, loud and hard on refugees and asylum seekers. I've done it so well in this election that I've given ASIO the powers to tackle people-smuggling." We know, through the evidence given to the committee, that this legislation will not deal with the actual issue. During the inquiry I asked the departments themselves, both ASIO and the Attorney-General's Department, how effective this legislation was actually going to be, pointing out that the organisation of people-smuggling is not done primarily from Australia; it is done offshore. They agreed. This legislation as it is currently written is badly argued and badly drafted. It is only for show for the Rudd government. It does not deal with the actual issues at hand. There is no mention of our obligations under international law, no mention of the definitions that we have signed up to under anti-people-smuggling protocols and our international obligations. There is an anti people-smuggling protocol. Australia is a signatory to it. Yet we have not even incorporated the definition of people-smuggling that the protocol uses. We have made up our own so that it suits us in this piece of legislation. Like many in the legal profession, the Greens have serious concerns that this bill in its current form not only breaches our obligations under international law but also breaches our obligations under domestic law. We remain very concerned that this bill is a direct attack on refugee communities within Australia and on those who support them. Despite assurances from the Attorney-General's Department during the course of the Senate inquiry that innocent individuals would not be caught under this poorly drafted legislation, the definition of 'providing material support', which nobody seems to be able to define, is such that anyone here in Australia who sends money to a friend or relative in a refugee camp who subsequently - without the awareness of the person who sent that money - uses that money to pay a people-smuggler could be charged under this broad definition. This legislation is poorly drafted and too broad, and yet it does nothing to tackle the issue of people-smuggling or the issue of our obligations to asylum seekers under international law. The point is: if the intention is to catch those individuals who provide humanitarian support, then why not make it explicitly clear in the legislation? It has been argued that no court would actually convict somebody who is providing humanitarian assistance to someone overseas who may then use a people-smuggler to get out of a horrific detention facility in, say, Indonesia. If that is the case then why allow those people to be investigated in the first place - under broadening the roles and responsibilities of ASIO, allowing ASIO to use their current powers of interrogation and surveillance and possibly charge them in the first instance. The government says these are not the people we are targeting. These are good-hearted Australians doing what they have always done -support the most vulnerable people in other parts of the world, particularly in our own Asia-Pacific region. If the government's intention is not to target them then it should go back and redraft this legislation, because this legislation currently captures them. It is far too broad. This legislation targets refugee communities in Australia who are sending remittances to their families overseas. Every time they send money across to a relative, if there is a chance that that relative is going to get on a boat at some stage, they are at risk of being put in jail for 10 years. This legislation will only be seen by the very vulnerable emergent communities in this country as a direct assault on them - a frontal attack. Who is the government trying to win over with this legislation? They are not delivering anything that tackles the issue of people-smuggling and they are not doing anything to deal with the fact that we have people in places like Indonesia and Malaysia, desperate for freedom, security and a future, who have been found to be genuine refugees. It does not deal with any of those things. What is this about? It is purely so that Kevin Rudd can say: 'I am as tough as Tony Abbott. I can kick refugees too. Just watch me.' That is what this legislation is about. It is so that Kevin Rudd can stand up and think that he can be as tough as Tony Abbott. But neither of them are tough, because neither of them are actually dealing with the real issue. Australia has obligations under international law to protect asylum seekers, to process their claims. I know the government does not believe in processing people's claims any more; they have suspended that. "That is all right. We will just put that aside for a little while. Who cares about international law or our obligations?" It is actually not the tough, strong thing to do to kick those who are most vulnerable in the world. The strongest thing to do is stand up and face the responsibilities we have and find mature, practical, humane and fair ways of managing it - for example, increasing the intake of resettlement of offshore asylum seekers, not warehousing them in desert prisons like Curtin and not setting up a whole new system of laws and regulations that are going to be seen as a direct attack on those within the Australian community who support refugees and asylum seekers. Church groups around Australia collect money on a weekly basis for individuals and families in refugee camps or those waiting for the determination process. Imagine if something happens and those people get so desperate that that money ends up getting spent on people-smugglers because they have to get out of that situation. These are the types of cases we are talking about. While all sides of politics can agree that the people-smuggling trade appallingly exploits innocent individuals who are desperate for freedom and desperately fleeing persecution, the Greens do not believe that the Anti-People Smuggling and Other Measures Bill 2010 deals with those issues, as I said in my earlier remarks in this debate. Rather, we have a situation where providing humanitarian assistance to asylum seekers could be criminalised under this bill, particularly as it fails to reflect our obligations under the current international anti-people-smuggling protocol. We are a signatory to that protocol yet its definition is not used in this legislation. The protocol that we are a signatory to specifically states that it does not aim to punish individuals who assist smuggled persons purely for humanitarian reasons. That is the difference between it and this bill. The fact that the government has failed to commit to a charter of rights, which would enshrine our commitments under international law and provide an avenue for human rights challenges in Australian courts, gives cause for concern with this legislation, particularly when it unintentionally captures innocent individuals simply because it is so poorly drafted and broad, does not include the correct definitions and, therefore, does not fulfil its aim to criminalise genuine people-smuggling. The bill does not reflect the issues in relation to people that are helped on humanitarian grounds. (b) a statement of the bill's compatibility with Australia's international obligations has been produced and tabled in the Senate. The government say that the Parliamentary Joint Committee on Foreign Affairs, Defence and Trade Human Rights Subcommittee is their new measure for moving forward with any legislation that has questions around its compatibility with human rights and international law. Why not let this bill be the first one to go through this committee? If the government are honestly committed to ensuring that individuals' human rights are not violated and that legislation is not flawed in relation to human rights and civil liberties, then they should let this legislation go through that process. The Greens will not be supporting this legislation going to the next stage until it has moved through that committee and a statement of its compatibility with our international obligations is tabled in the parliament. Why would the government, after announcing that this is their new process and that this is what they are committed to, not take the opportunity to test it out with such an important piece of legislation? It is clear from various submissions provided to the Senate committee which looked into this legislation - the committee inquiry which was rushed and whose report is one of the poorest I have seen in my short time here in the Senate - that the new offence in the amendments to the Criminal Code Act 1995 and the Migration Act 1958 is too broad and ineffective, particularly in the ambiguous reference to material support, which I spoke about earlier. Not only is this term vague and indeterminate, with concerns about fairness and due process, but it also presents problems with our obligations under international law, including the refugee convention. Australia is a signatory to the anti-people-smuggling protocol, the International Covenant on Civil and Political Rights and the Convention on the Rights of the Child, yet all the legal evidence given to the Senate committee inquiry into this legislation raised concerns that it breaches our commitments to them. Yet that has been left out of this piece of legislation. This requirement already exists in the people-smuggling offences under the Criminal Code. Why do we need this definition of material support, which does not offer any more clarity about the types of issues and individuals which this legislation will deal with? Under this bill, the requirement for a profit motive to exist is omitted. So, if a person helped somebody to escape an awful situation where they were fleeing for their life or from persecution, this bill would say that the person helping that individual is a criminal, without even a transfer of money. It simply does not make sense in relation to what the government suggests is the intent of this legislation. It is obvious that there is strong concern that, if this legislation is passed in its current form, it would criminalise activities of aid organisations, humanitarian workers, charity and church workers and other individuals who assist people across borders for humanitarian reasons. Why is it that the government has not included the international definition of people-smuggling? If the government intends to tackle genuine people-smugglers, then why is that not clearly defined in this legislation? There is really no argument for not doing so. Of course, that is why this piece of legislation should not proceed until it is further looked at. It is such a poorly drafted, poorly targeted piece of legislation. One of the witnesses, indeed, during the inquiry said that it was the worst piece of legislation she had ever seen, and this was from a quite significant person in the legal profession in Australia. Despite having previously appeared in front of the committee long before the Rudd government were running the country - that is, during the Howard years - she still made the point that this was the worst piece of legislation she had ever seen. It is clear from the government's own submissions that there has not been adequate time to consider this bill. The failure of the government to articulate why it is necessary to introduce the new measures proposed in this bill highlights why public consultation and debate are necessary. I strongly urge the Senate to support the second reading amendment put forward by the Greens that suggests that this bill should not proceed until it is further scrutinised and checked off by the new Human Rights Subcommittee so that we can really have an understanding of the impact it will have. A leading refugee advocate and legal academic says the government's new anti-people smuggling bill is inconsistent with international law. Director of the Migrant and Refugee Rights Project and Senior Lecturer at the University of NSW Law School, Bassina Farbenblum, says the law is 'ill-conceived and dangerous'. "The Bill completely ignores the fact that the overwhelming majority of people smuggled into Australia are refugees - people to whom Australia has protection obligations under international law, and who have a right to seek asylum and not be penalized if they enter Australia without a visa," Ms Farbenblum says. One of the key components of the Anti-people Smuggling and Other Measures Bill is the possiblity of people in Australia being prosecuted for sending money to relatives overseas, if that money is then used for illegal entry into Australia. "This is a dangerous and ill-conceived piece of legislation that will disproportionately harm the most vulnerable people in this country," Ms Farbenblum says. "It allows ASIO to spy on refugee communities in Australia who are often already traumatised by experiences of government abuses in the countries they fled. "A refugee can be prosecuted if the government claims she was "reckless" as to whether some portion of any financial support that she sent to her family overseas would be used to pay smugglers. The potential for abuse of these provisions is obvious," she says. The Bill, which was passed earlier this month after gaining the support of both major parties, has been heavily criticised by refugee advocates. The Refugee Council of Australia (RCOA) wrote to the Attorney-General's office expressing concern over the Bill shortly before it was passed. "This law could target people sending money to support a family member in a refugee camp," RCOA head Paul Power says. Speaking against the bill, Greens MP Sarah Hanson-Young told the Senate she was concerned over the expedient passage of the legislation. "While it is clear that the Greens are in no way supportive of people-smuggling, that does not mean that this Senate should give up its responsibilities as a house of review; its responsibilities to scrutinise legislation - and this legislation is so, so poorly drafted," Ms Hanson-Young says. Critics of the legislation have drawn comparisons to the case of Indian-born doctor Mohamed Haneef, who was detained in Australia after his sim card was implicated in the failed Glasgow Airport attack. Dr Haneef was charged with providing material support to a terrorist or terror organisation following the discovery of the sim card in the Jeep used in the attack. Greg Barnes, director of the Australian Lawyers Alliance, wrote in Crikey last month that the bill draws on post September 11 anti-terror laws. "The flaw in what are termed 'extended liability' offences is that they drag into the net people who are completely innocent, such as Dr Haneef," Mr Barnes says. Humanitarian aid is now in the firing line of the refugee debate in Australia's electoral race to the bottom. persons who provide material support or resources to people smugglers may be found guilty of supporting the offence of people smuggling irrespective of whether they received financial or other material benefit. a person commits an offence if they provide material support or resources to another person or organisation and in doing so, aids the commission of the offence of people smuggling. The penalty is imprisonment for 10 years or a fine up to $10,000. In the Senate proceedings on May 13, Labor Senator Penny Wong said the Bill, passed on the same day, "is targeting criminal groups who are involved in organising and benefiting from people smuggling activities". Unfortunately, due to the unusually ambiguity of the wording -- which has little other goal than leeway for political use -- the Refugee Council of Australia voiced concern to the Attorney-General the legislation could criminalise the activities of aid organisations, humanitarian workers, charity and church workers and other individuals who assist persecuted populations seeking asylum for humanitarian purposes. The removal of a test of benefit, combined with silence as to the type of explicitly criminal activities the Act is designed to address, presents two clear problems: the capricious use of these provisions to prosecute those who have acted only charitably and with innocent motive; and the increase in risk borne by humanitarian organisations whose well-meaning aid might easily be classified in retrospect as "material support". The lack of effort to protect people who may be inadvertently caught by this legislation is exacerbated by the fact that the term "material support" is not elsewhere defined in Commonwealth legislation and instead seems to have been casually cribbed from the United States Criminal Code. For my community, the diaspora Tamils living in Australia, the threat of the new Bill is very real. Every one of us has been affected by the war in Sri Lanka, which last year saw the slaughter of up to 40,000 Tamils in Colombo's brutal military offensive. Post-conflict Sri Lanka has seen no attempt at a political solution to address the dignity and reasonable aspirations of its most disadvantaged ethnic group. Up to 90,000 Tamils remain imprisoned in Sri Lankan government-run military camps and there is a continuing witch-hunt for Tamils who had links or were part of the Tamil Tiger separatist movement. Tamil males between 18-45 are hot targets. Media and aid workers in Sri Lanka continue to be censored and sometimes kidnapped or killed. For those who survived the 26-year civil war, the diaspora is the key support network in the slow and painful recovery. Only Australia is now being so callous as to classify all support as having potentially criminal consequences. The Refugee Council has noted this Bill is inconsistent with Australia's international obligations, in that it does not acknowledge asylum seekers have a lawful right to enter Australia for the purposes of seeking asylum. While much of the emphasis of our current deplorable debate around refugee policy seems to imply that boats coming to Australia are simply illegal immigrants, the truth is that fear and desperation are the most common motives, and asylum remains a critical part of the process of protecting the disenfranchised. "It means the vast majority of asylum seekers worldwide need protection but can't get it and the only way they can get it is by getting on a boat, paying a people smuggler and coming to a place like Australia. The problem is there are no solutions for people that need protection and that is driving demand for people smuggling." Fixing the root causes is not going to make the government look stronger in the face of growing dog-whistling by the coalition, so the smart political money is on a race to see who can be tougher on refugees. While we appreciate that the motives of people smugglers are rarely admirable, the plight of refugees shouldn't be conflated with the business of those they are desperate enough to trust. It would take a brave and honest government to seek to explain the principle of charity to the multitude of voters who claim they want strong action on boat people and actively fear the influx of refugees from troubled lands. Sadly, that principle seems to have been suspended by our otherwise overtly Christian political leaders. In true post 9-11 politics style, the Australian government is going after anyone, even non-criminals, to look tough and in control. But the willingness to compromise international obligations, and labeling humanitarian assistance as a criminal act, goes against the innate instincts of humanitarian pragmatism. Like the freeze on the processing of asylum seekers from Afghanistan and Sri Lanka, this is just another show by the Rudd government and the coalition of their concern of politics over justice. If it criminalises well-meaning humanitarian support, that will be lamentable. If its further consequence is to force the removal of aid from the most abused people on the planet, then that will be truly criminal. Brami Jegan is a Sri Lankan, a visiting scholar at the Centre for Peace and Conflict Studies, University of Sydney and a refugee advocate.